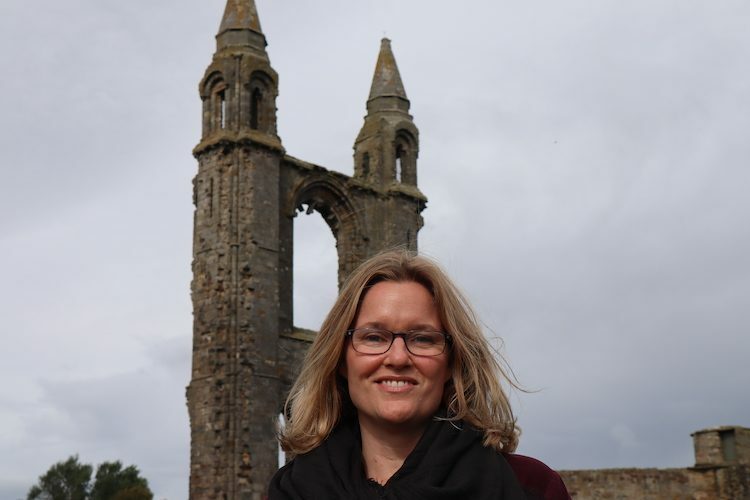 Professor Jenna Reinbold is currently leading Colgate's Scotland Study Group. Experts in the field of religious studies are taking notice of Associate Professor of Religion Jenna Reinbold’s new book, Seeing the Myth in Human Rights (University of Pennsylvania Press). The work, which analyzes the underlying religious logic of the 1948 Universal Declaration of Human Rights, has received the 2018 Award for Excellence in the Study of Religion from the American Academy of Religion (AAR). Human Rights Review describes the book as a “thoughtful and sophisticated” interdisciplinary exploration. Reinbold initially became interested in this topic because, unlike earlier political declarations like the American Declaration of Independence, the Universal Declaration of Human Rights purposefully lacks overt references to the divine. “To make a reference to a divinity of any sort would create a document that would appear to be specific to one religion and not others,” said Reinbold. Despite its creators’ efforts to render a secular document with no particular religious affiliation, Reinbold argues that the language of the declaration has a religious quality to it. Her book offers an explanation of this religious dynamic by using the term “political myth” to describe this phenomenon. This type of myth, she says, is not to be confused with the imaginary; rather, she uses the term to describe a complicated intertwining of the religious and the secular within contemporary human rights. Seeing the Myth in Human Rights can be found here.